Tacoma is a long haired Akbash. This breed originated from Turkey as a livestock guardian. Tacoma is incredibly smart, silly, athletic and she is a great guardian. Her listening vocabulary is greater than any dog I've known. She picks up on words I don't teach her and tries to stay one step ahead of me throughout the day. For example, if I'm looking for something and say it out loud, she will bring it to me. One time as Maria and I were running late for church, she sat at the front door holding the handle of the Bible case and Bible in her mouth. She also has a great sense of humor. Tacoma is the boss here. All of the guardians look up to her. She is David's bonded mate and the mother to Goliath, Samson, Solomon, Esther and Ruthie. Tacoma was raised by Koda. She has raised David and taught him all she knows. Tacoma also is undefeated in the 3 Doggy Dashes that she's entered locally. Esther is one of our smiling guardians. When she gets excited she will bare her teeth in a big grin. She is one of the initiators of play and she gets along with all of the guardians. One of her favorite non-dog friends is our Aunt Maggie the donkey. They are often seen together hanging out and enjoying each other's company. When it comes to guarding Esther is all business. After David, she has the deepest bark of the whole guardian team. Esther is quite an athlete too. She pulls us on a dogsled and has won a local dog 5K along with tying for first with Tacoma and Ruthie. Esther is 75% Akbash and 25% Great Pyrenees. Her mother is Tacoma and her father is David. Esther was named after the brave Queen Esther of the Bible who saved her people. Esther's favorite guarding place is to sit on top of the duck house so she has a better vantage point. There is so much to say about Goliath. He is an amazing dog with a huge personality. 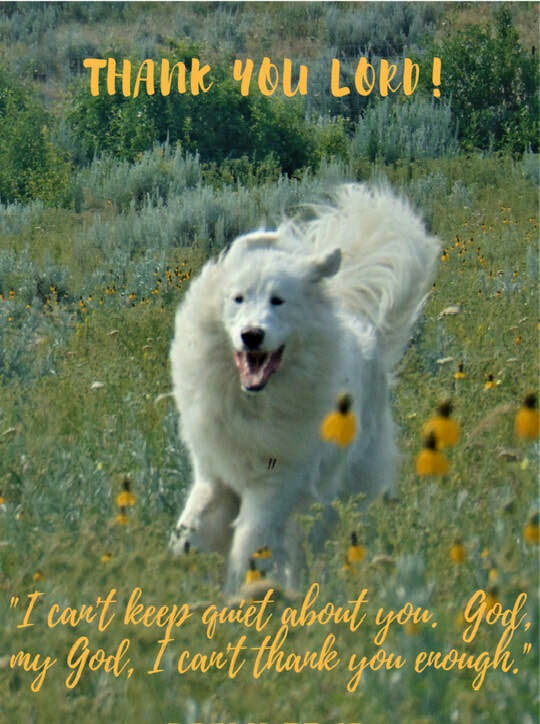 Goliath is our miracle puppy, that I believe God found favor upon. Before Goliath turned 1 year of age, he was having issues with walking. Xrays at our local vet showed severe hip issues that he was born with. I made him an out of state appointment with an orthopedic surgeon for further Xrays. In the meantime, I saved up money in the hopes of buying him new hips. The specialist gave us bad news, and that was that Goliath's hips were so severe that he did not qualify for new hips. The only thing we could do was to have the femoral heads of the bones cut off to alleviate pain. To get better on his own without surgery was impossible we were told. In preparation for surgery I wanted him to be as strong as he could be. I built him a heated therapy pool in the dead of winter in Wyoming out in our garage. He had only been in it a handful of times, as I prayed for him late one night for God to please be clear on what to do. It was a heartfelt teary prayer under the stars. I walked in the house after praying and Goliath was standing on the couch, something he could never do before. That was enough clarity that I needed on what to do. I knew I was to wait on the surgery and that God had another plan. It was the quickest answered prayer I have ever experienced. That week Goliath surprised me by showing up at our side door that has stairs. That was another thing he could never do before. It wasn't long before our special puppy with the limp, was running and doing zoomies with the others. It has been over a year now since that prognosis. Goliath has not been on any pain meds since that night that we received our answered prayer and miracle. He has no limp and is one of the most active guardians here. He's always on the go. When the orthopedic surgeon's office called to schedule his procedure, I told them of what was going on and that I believed God had answered our prayers. The rehabilitation lady at the clinic said, if he is doing these things that you say, he most likely will never any intervention. He was not supposed to get better but only worse. Goliath has established himself as the fastest runner out of the boys, and what we call the "alpha puppy." He is the leader of his siblings When we go dog sledding as a group of 7 he is now our lead dog. Goliath is a great guardian. He likes to howl and sing about once a day with his mother, Tacoma. They are the only two that sing a wolf-like song. One of Goliath's favorite games is to steal my mittens so I will chase him for it. Goliath's father is David. Solomon is the son of David and Tacoma. He is our tender-hearted boy. Solomon is so very sweet but a fierce protector of "his" animals. Solomon just like his father, never had any learning curve when it came to knowing how to be gentle with the tiniest of animals here including our bunnies, ducks and chickens. Solomon is named after the wise King Solomon of the bible, the author of the Proverbs. Solomon has lived up to his name by being a wise guardian. He thinks before reacting. Solomon's nickname is "fluffy puppy" because he has such beautiful, soft and fluffy hair. Solomon gets along great with all of the guardians here. He has a loud bark but only uses it at a perceived threat. Solomon likes to go running with me, and I cherish one on one time with this magnificent and beautiful dog. Samson is a mama's boy with me the human mom being his mom. When he was little he loved to cuddle up to me any chance he could get. He never grew out of it to my liking. To this day he sleeps by my side, never missing a night with his head on my pillow. Samson loves to play and responds every time when I say "That Sam I Am, That Sam I Am. I do, I love that Sam I Am." Samson likes to be silly. He gets along great with all of the guardians here but his best dog friend appears to be Ruthie. Ruthie and him sleep next to each other and me. We call them "The Littles" because they are our smallest guardians. Samson's dog mom is Tacoma and his dad is David. Samson also goes by the name Sammy-son. He is a great guardian and likes to sleep outside until I go to bed then he sleeps with me. He is quiet unless he sees or hears a perceived threat. Samson is very alert and doesn't miss a thing that happens on our farm. Samson is 75 Akbash and 25% Great Pyrenees. We like to call Ruthie the baby of the family because she was last born of the puppies and because she is the smallest guardian here. When she was born I was a little concerned and kept an eye on her because she was the smallest. At one point she wasn't gaining much weight so I offered her a bottle but she would have nothing to do with that. To my surprise she was the first puppy to crawl and first puppy to open her eyes. Ruthie has continued to excel physically. She is our fastest and most agile guardian. Ruthie likes to do zoomies as the whole pack tries to catch her. She is so fast that she is very hard for them to catch even with all the guardians participating in the chase. Ruthie loves being with Samson and sleeping next to him and me every night. We call Ruthie and Samson "The Littles" because they are the smallest guardians here. Ruthie also spends a lot of time with her sister Esther.Ruthie is our most eager puller when we go dog sledding with the guardian team. 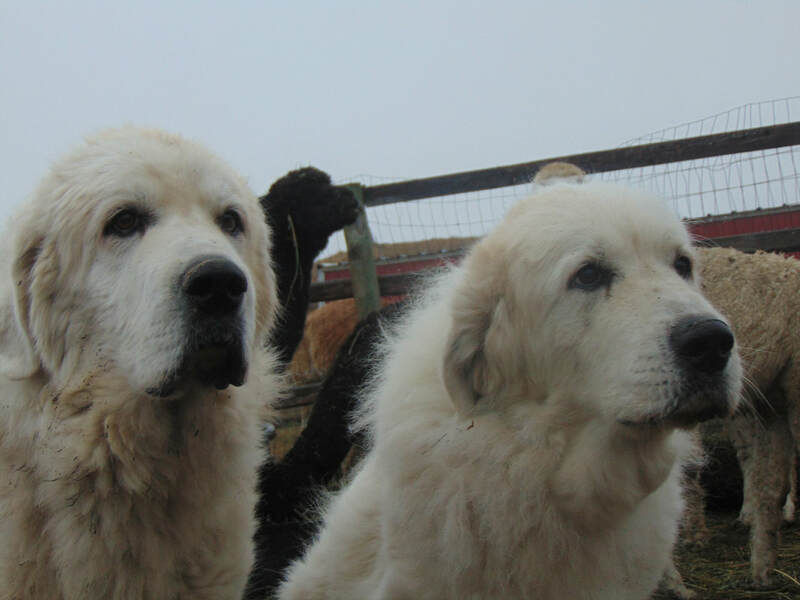 Koda and Kyra are Great Pyrenees sisters who started it all, arriving to our farm with the alpacas in 2005. During their whole time here, they have kept all of their animals safe. We have continued to have a zero loss to predators rate on our farm thanks to these dedicated sweet sisters. Kyra has passed on to heaven on December 10, 2018 at the age of 13 years and 1 month old. Koda survives Kyra and still chooses to guard everyday. Kyra guarded to her last days and then passed on quickly, not taking any retirement. It looks like Koda will be the same way as her sister. Koda is extra special because she raised up Tacoma as her own when we brought Tacoma home as a puppy. We are thankful for every day with Koda. She is one of a kind. Here is one of the last photos that I got of them together before Kyra passed on. They are over 13 years of age in this photo. Koda is on the left and Kyra is on the right.